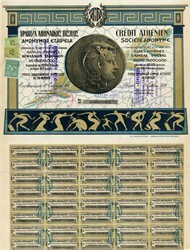 Beautiful certificate from the Credit Athenien Societe Anonyme issued in 1925. This historic document has an ornate border around it with with dancing figures.and a vignette of the head of goddess Athena wearing Attic helmet. This item has the printed signatures of the Company’s Officers. Cancellation stamps. Certificate Athena, the goddess of wisdom and military victory, and also the patron of the city of Athens, was Hercules' half-sister. Her parents were Zeus and Metis, a nymph.